An amphibian writer, translator, poltergeist,researcher... my doppelganger pretends to be a Professor of English, The Maharaja Sayajirao University of Baroda, Vadodara. The study of relationship between caste and literature in India has primarily been dominated by the Dalit Studies, which justifiably interrogates the ' Sawarna-Upper Caste' hegemony in literary and cultural studies from the Ambedkarite position. Statistically speaking the Dalits, ( the former ' untouchables') who are usually categorized as ' Scheduled Castes' ( SC) and Scheduled Tribes (ST) by the constitution of India, form roughly 30% of Indian population as per 2011 census. Approximately 40 % of population in India comprises of a multitude of castes and communities classified as ' Other Backward Classes' or 'OBC'. The Wikipedia graph about the OBC is informative. Friends of South Asia or FOSA has put together a website Friendsofsouthasia.org which provides useful information about this social category. It notes, " The OBCs comprise, by and large, the lower rungs of the Sudras who, in the past, suffered from varying degrees of ritual prohibitions applied to the a-dvijas (literally, those not twice-born) and remain till today socially and occupationally disadvantaged". It also notes, " "OBCs, by profession, being small cultivators, agricultural laborers, artisans and also being engaged in weaving, fishing, construction work, etc. and these occupations being common to SCs and OBCs, the status of OBCs cannot be treated as very much different from that of SCs ....OBCs constitute a majority of poor and backward population which produced a variety of goods and services, but on terms and conditions unfair to them." However, in the study of sociology of Indian literature, the category of ' OBC' has not received the importance it deserves. One of the most significant statements comes from a renowned Marathi writer Vilas Sarang (1942-). In his provocative essay, " Marathi Sahityatil OBC Yug' ( in the magazine ' Khel' vol. 7, 2007) he attempts to theorize the relationship between this societal category and the poetics practiced by these writers in terms of the questions of identity. 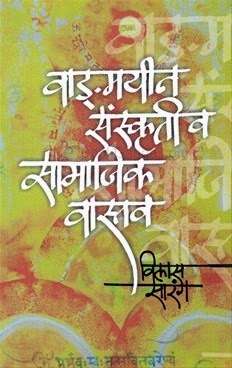 The essay is later anthologized as ' Marathi Vangmaiyatil Madhyamvarniya Yug' in his collection of essays Vangmaiyeen Sauskruti ani Samajik Vastav (2011). Sarang points out that this mass of ' Other Backward Classes' is a heterogeneous and scattered one. It lacks any ' face of it's own'. Historically, the modernist poets of the nineteen forties and the fifties in Marathi like BS Mardhekar or Vinda Karandikar were from the upper-castes. After the sixties, the Dalits and OBCs started making in-roads into Marathi literary world. While the Dalits were aggressive and assertive, the OBC writers were very often on the ' middle grounds'. Sarang points out that Bhalchandra Nemade, a major OBC writer of this period, failed to provide leadership as he remained closer to the identarian politics of ' grameen' writing and 'sub-culture' ( pot-sauskruti) politics. As the time proceeds, the ' grameen (rural) literature' will give way to the category of ' OBC' literature, Sarang notes. In short, great shift in literary values is under way. Sarang remarks that in terms of literary practice, it did not have a poetics of its own. It often used the brahminical upper caste aesthetics, or used the Modernist idiom, or used the Dalit poetics or often followed the poetics of' grameen' or ' rural' literature. After 1980, Sarang argues, however the situation changed and the OBC writers started asserting themselves in poetry. Their preferred mode was 'realism' which gave rise to ' realistic and unadorned poetry in Marathi.' They could not identify with the poetic idiom of the poetry of earlier generation be it conventional-romantic one or be it modernist one. It seems the OBCs' search for their own identity, their own face and their own voice will be critical for Indian cultural scenario. Sarang's conceptualization, irrespective of its accuracy, is fascinating and has far-reaching implications for literary studies in India. It is interesting how he changed the title of his essay from ' OBC' Yug (2007) to ' Madhyam Varniya' ( of Middle Varna) in his collection in 2011, probably to avoid controversy. However, some questions need to probed further. For instance, why did the OBCs stay away from Dalit politics and poetics? What was the impact of the Mandal Commission implementation and the rise of OBCs as a force in Indian politics on the way Indian literature was read and written? What is the impact of the swing of the OBCs towards the erstwhile upper caste party BJP ( see the statistics from the Hindu given below) on cultural politics of India, especially, the identarian ones? Specifically, with the OBC as a Prime Minister who has a thumping support from the upper-castes as well, what will be the trajectory of OBC identity politics in India? As the Friends of South Asia website tells us, the OBC is a dynamic category. What we need today is more contemporary sociological framework in the study of Indian literature to explain this dynamics and I don't think we are anywhere near to deal with this.